Is Conflict the Secret to a Successful Business? Conflict in the workplace is inevitable. Don't fight it. If handled correctly, conflict can actually lead to happier, more engaged employees -- and that translates into a better business. Conflict in the workplace is inevitable, but, if handled correctly, it can actually lead to a more engaged and productive workforce. The key is to maintain professionalism at all times and remember to be empathetic, says Piera Palazzolo, senior vice president, Dale Carnegie Training. "The most important thing to remember is that conflict isn't inherently negative," says Palazzolo. Conflict, while uncomfortable and disruptive, can actually be a great sign that your employees are motivated, engaged, passionate and invested fully in making your business and your company succeed, she says. "Sure, you may believe that nothing's wrong if everything's going smoothly, but that's not always the case. Maybe people are just 'going along to get along,' and they're not as engaged or involved as they could be," Palazzolo says. "If there's conflict, it shows that your people care; they are engaged and passionate and they are willing to argue for their position and for their success at work. The trick is making sure that conflict is managed correctly so that it's used to the betterment of the business; to get different points of view, to investigate different ways of doing things, to promote innovation and out-of-the-box thinking," Palazzolo says. In other words, make sure that any conflict results in increased cooperation, according to Yves Morieux and Peter Tollman in their book, "Six Simple Rules: How to Manage Complexity Without Getting Complicated." "Cooperation matters because it is a necessary condition for effective teamwork and it matters more as the business environment becomes more complex … [w]hen two people cooperate, they move along a continuum to a spot that is not ideal for either but that is more beneficial for the overall result. The adjustment comes at a personal cost-professional, emotional, reputational or financial. The cost is by no means lessened by the possibility of sharing the benefits. To cooperate, people need to come together, understand each other's needs and produce a result that's more than the sum of its parts. When you try to accomplish that, tensions can rise and people's emotions towards each other can intensify." Eventually, however, the conflict that's creating these rising tensions and intense emotions can actually make for a happier workplace - and a more successful business, according to the book. "One of the rewards of more cooperation-and sometimes conflict-is that people are happier. In a clumsy, slow-moving organization, people become frustrated and disengaged because their work has no impact. Ironically, when you let conflict happen and sometimes encourage it, people get angry and fight with each other-and that makes them happier, because in the end they did difficult, important work that made a difference," Morieux and Tollman write. 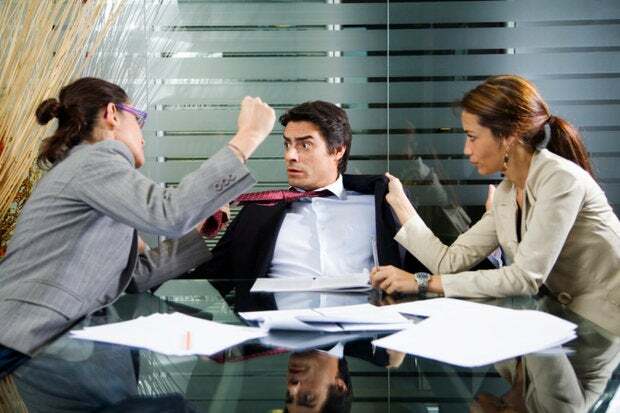 That doesn't mean you should just step back and let employees battle it out in a conference room; you have to ensure conflict is handled productively and constructively so that it benefits all involved, and furthers the greater business goals, says Dale Carnegie's Palazzolo. The first thing to remember is empathy, Palazzolo says - being open to differences of opinion and other points of view and showing respect for those, even if you disagree. "One of our foundational principles at Dale Carnegie is empathy - always try and appreciate the other person's point of view, how that fits into the business strategy first before your own," Palazzolo says. And make sure that conflicts, when they do happen, are kept within a business context and aren't allowed to fester and become personal attacks. "If you're involved with conflict, whether it's on a project or whether it's a more general disagreement about work habits, hours, what have you, make sure it's not becoming personal. Make sure the arguments stay professional at all times," Palazzolo says. "A good question to ask to keep things on a professional level is, 'What is it about this issue that you cannot endorse? What is it about this strategy that you can't get behind?" she says. Palazzolo also advises keeping the "big picture" front and center in any conflict resolution strategy; sometimes the end goal can get lost in the minutia of every day work, she says. "In conflict resolution, you have to make sure the end-goal is always in mind. And you have to make sure that the conflict isn't stemming from the business' expectations or the project scope or scale in general; ask yourself, 'Is the strategy wrong? Does everyone on the team know what the actual goal is? Do they know their roles and the expectations for their work?' You should go back and revisit if you've set the right goals and trajectory for your project, and see if any of those aren't in alignment with the work your teams are doing," she says. You also need to ensure you get buy-in and solicit feedback from those teams, Palazzolo says. By fostering an open discussion that invites comments and constructive criticism from everyone involved can head off unnecessary conflict and can make inevitable arguments easier to handle. "It seems obvious, but one of the things we teach is basic problem-solving. Lay out the pros and cons of 'Position A' versus 'Position B,' and predict all possible outcomes that can happen for each; both worst-case and best-case. Once you make a decision, you must make sure that everyone's bought in to the direction you've decided on," Palazzolo says.